Just like the city is itself, you'll find charming B&B's nestled in the cherished corners and nooks of St. Augustine. How will you decide which one to trust to be your most accommodating host? We invite you to strongly consider Carriage Way. With nine guest rooms to choose from, we're sure you'll find just the one that makes you feel like you're on a five star vacation, yet right at home. Our delicious breakfasts will be more than enough motivation to get you out of bed, but no judgment here if you feel the need to stay in all day. That's what we're here for – to be what you want us to be. We strive to provide you with all you could need, so you can have a true retreat, but our convenient location also makes it ideal for guests more interested in going out and about. Browse our rooms online, check out the photos, and read about us. You'll be happy to meet our innkeeper, Michaele, whose dream has come true with Carriage Way. Meeting her will be a highlight of your stay, as she makes it a point to introduce herself and ensure you're enjoying yourselves. 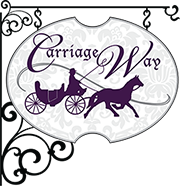 Carriage Way isn't just like every other bed and breakfast in the city or in the state, for that matter. We pride ourselves on giving the utmost personal attention, taking customer service up to a whole new level. We do all that we can for our guests, including making reservations at nearby restaurants, recommending things to do in St. Augustine, and exceeding your expectations as your St. Augustine bed and breakfast. We hope to welcome you soon.